Clear Aligner Orthodontics - Michigan City Dental, P.C. | Michigan City Dental, P.C. With new dental technology we can straighten crooked teeth with nearly invisible retainers. 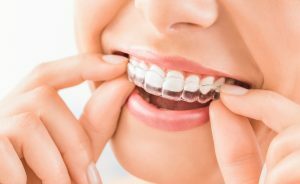 These retainers apply light pressure to teeth that are crooked or spaced apart, gently ushering them into their rightful location in your smile, giving you the straight, beautiful smile you have always wanted!